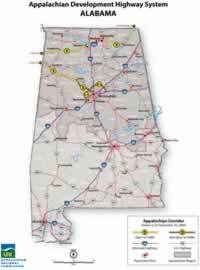 The Alabama Department of Economic and Community Affairs - Energy, Weatherization and Technology Division (ADECA-EWT) has partnered the the Alabama Clean Fuels coalition (ACFC) to create clean biofuels corridors along Corridor X and Corridor V in the Appalachian region of Alabama and aggressively promote the fleet use of biodiesel in the area. Up to 30 retail outlets for biodiesel will be established along the corridors, and a comprehensive marketing campaign will be employed to build the biofuels market in the Appalachian region of Alabama. The campaign will target both the public and private fleets in the area. This project will address both the ARC and ACFC's strategic objectives of increasing the use of renewable energy resources in the target area and promoting new energy-related job opportunities in Alabama's Appalachia region. The location for this biofuels initiative will be the Alabama counties bordering Appalachian Region Development Corridor X / Future Interstate 22 (U.S. 78, Alabama 4) and Appalachian Regional Development Corridor V (Alabama 24, Interstate 565, Alabama 2, and U.S. 72). The counties included in the target area are Franklin, Lawrence, Morgan, Limestone, Madison, Jackson, Marion, Walker, and Jefferson. The goal of this initiative is to develop the retail biofuel market in Appalachia by establishing up to 30 retail sites for biodiesel (B20) along Corridors X & V by encouraging the adoption of biodiesel by both public and commercial fleets in the Appalachian Region of Alabama. This will provide ample refueling opportunities for motorists traveling along the corridors and will establish a local market for alternative fuels with the potential for future growth. In addition this project will also enhance an emerging local market for biodiesel use in off-road equipment in the region - primarily in the mining industry. The initiative will also increase the availability of biodiesel to the agricultural sector and will contribute to building a strong and sustainable "asset-based" economy in the region. The availability and use of biodiesel in the target area will also contribute to a cleaner environment and enhance the quality of life in the regions by lowering the harmful emissions associated with burning petroleum diesel fuels.